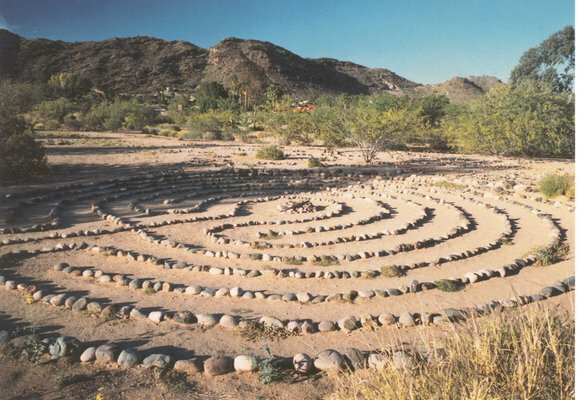 On a lovely Saturday morning this Spring I walked the labyrinth on the grounds of the Franciscan Renewal Center in Scottsdale. I had been thinking of doing this for Lent. Suddenly, in the coolness of a spring morning, I was invited to an event to do just that. The invitation came from a name I did not recognize on Facebook, but saw that an acquaintance of mine was going and decided that maybe I had met the woman somewhere. Ruth Davis was having a birthday and decided to share her walk with her friends. Somehow I got into the mix. She told me later that she had not actually invited me. But I went and was delighted to meet new friends. I have learned not to question serendipity but to accept. It usually comes with divine timing. Amidst the desert blossoms of Arroyo lupine and quail bush we walked the path of the stones. I have walked other labyrinths in different parts of the country and found this setting to be the most beautiful I have ever seen. Tiny lupines and desert primrose were waiting to show their colors. I arrived early and waited for the group while sitting on a bench facing the labyrinth . The mountains above had houses in sight on mounds and built in crevices. The desert terrain was beautiful and I decided to myself to walk in silence and ask a personal question, seeking to walk with a listening heart. When the group arrived, Ruth began with introductions and we shared our intent regarding the walk. As we approached the entrance to the labyrinth I focused on staying in the moment. I walked slowly thinking of my question and then consciously letting all thought go as my meditation deepened. There is only one path which made me focus on each step winding my way to the center. I took deep breathes and inhaled Spring air as I journeyed the seven circuits around the circle. My question flew out of my mind and I received a completely different answer to a different question I had also been pondering earlier. Spirit’s way of letting me know that I was not in charge. As I completed this ancient ritual it felt like a representation of my life and all its experiences and challenges. I discovered that I had left my cares in the center and as I left the circle I felt an overwhelming peace surround me. I had received exactly what I needed. This sacred experience taught me once again how important it is to slow down and go inward, to listen and center ourselves in nature. This lovely Labyrinth was designed by Taffy Lancer, founder of the International Labyrinth Society. I am grateful for her vision.